On 26 October, 1886, Frank A. Bone of Lebanon, Ohio, county surveyor of Warren County, Ohio, patented a column keyboard adder (US patent 351487). 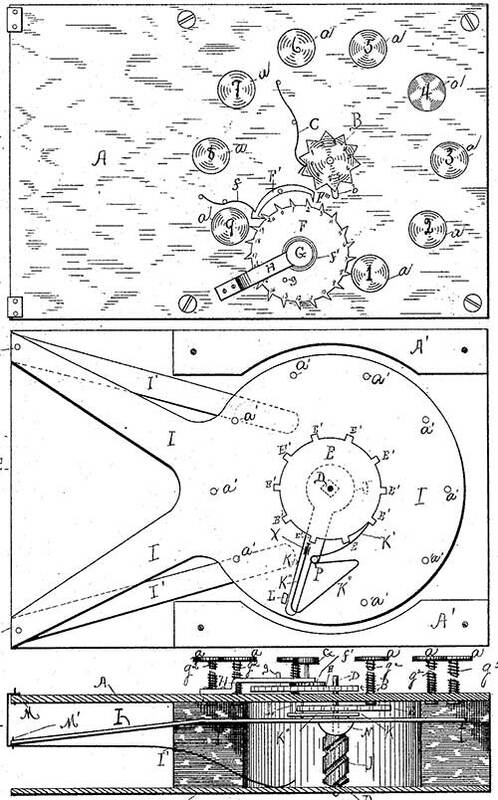 Let's examine the adding machine of Bone, using the patent drawing (see below the drawing). The object of the invention is to provide a new and improved machine for adding numbers by means of the manipulation of nine keys, representing the nine digits, 1, 2, 3, 4, 5, 6, 7, 8, and 9, which machine is simple, gives reliable results, and can be operated very easily and rapidly and with little mental effort to the operator. The machine is placed with the end having the keys thereon nearest the operator. The wheel B is set so that the zero will be under the point of the index-spring C. The wheel F is set with zero under the point of the pallet F’, nearest the wheel B. Suppose the numbers 36, 49, and 68 are to be added, the units-column is added first. Beginning at the top, the key No. 6 is first struck, which turns the wheel B six spaces, and to the position where figure 6 will be under the point of the index-spring C. Next key No. 9 is struck, which forces B nine notches farther forward, and to a position where figure 5 will be under the point of index-spring C. At the moment figure 9 of wheel B passes from under the point of the index-spring the projection b frees the pallet F’ from ratchet F and allows the wheel F to move forward one tooth and bring figure 1 under the point F''' of the pallet. Now, we can read as the sum of the figures added, one ten under the point F''' of the pallet and five under the point of the index-spring C, making fifteen units. Next key No. 8 is struck, which forces the wheel B forward eight more notches and shows figure 2 (tens) under point of pallet on wheel F and figure 3 (as units) under index-spring C on wheel B, making twenty-three units as the sum of the units-column. The figure 2 is set down under its column, as usual, and the two tens carried to the next column. Now, we want the figure 2 to show under the point of the index-spring, as that is the number carried, and we want to start with it. We want to change figure 3, that is under it, to figure 2. This can be done by striking key No. 9, and it matters not what figure is under the index-spring C, any other one of the digits may be brought under it by striking one key. The number of the key struck must be such that, when added to the figure already under the index-spring, the sum will be the figure desired, or that figure plus ten; and the zero-point may always be brought under the index-spring by striking one key, the number of which is the difference between ten and the figure which is already under it. After striking No. 9 and bringing figure 2 (the number carried) under the index-spring, the wheel E is turned back to zero by means of the head G, and we are ready to add the tens-columns. The keys numbered 3, 4, and 6 are successively struck, and as a result we find figure 1 under the point of the pallet on wheel F and figure 5 under the index on wheel B, showing 15 as the sum of the tens-column, including the two carried, and thus long columns may be added by striking successively the keys corresponding to the figures in the column, and the result will be the sum, and will be registered the tens on wheel F and the units on wheel B.
Franklin Alva Bone was born on 9 August, 1851, in Turtle Creek Township, Warren County, Ohio, USA, to one of Warren County’s oldest families. He was the first child of William Vaughn Bone (Feb. 25, 1829–Dec. 27, 1909), a prominent farmer of Warren County, and Amanda J. (Dunham) Bone (June 7, 1832–Nov. 30, 1913). William Vaughn Bone was farmer and stock dealer, born in Turtle Creek Township. His parents were John Bone (1810-1887), a native of Warren County, Ohio, and Christiana (Maple) Bone (1812-1901), a native of New Jersey. William had followed farming all his life, and for many years had been an extensive dealer in and raiser of live stock, particularly horses, which he has made a specialty. He had a fine farm of 125 acres, which had the neat and tidy appearance that marks it at once to the observer as the property of a perfect farmer. William has shipped fine horses to almost all the large cities of this country, and many of them brought him a handsome profit. William Bone married on 11 April, 1850, to the young Amanda J. Dunham, by whom he had four children—our Franklin (Frank) Alva (1851-1923), an engineer and inventor; Perry Vaughn (1854-1928), a successful teacher of Warren County and later president of Lebanon National Bank; Anna (Annie) Linda (1857-1924), the wife of W. S. Dilatush, an attorney of Lebanon, and Carrie (1860-1920), the wife of Morris Steddom, a farmer of Warren County. William Bone was one of the Board of Directors of the Lebanon National Bank, and occupied a prominent position among the thrifty citizens of Warren County. Frank Bone was a civil engineer and worked many years (from 1878 until 1991) as a County Surveyor of Warren County, Ohio. Later he became the author of two books in this area: Complete Atlas of Warren County, Ohio, published in 1891; and Centennial Atlas of Warren County, Ohio, published in 1903. Besides the above-mentioned patent of adding machine, Frank Bone was a holder of two more US patents: for automatic fire escape (US312076 from 1885), and for retaining-wall (US 705732 from 1902). Frank Bone married in 1880 to Mary Frances (Kell) Bone (Aug. 7, 1852–July 13, 1924). They had one child—Evan Paul Bone (1883–1959). Franklin Alva Bone spent most of his life in his home town Lebanon, Warren County, Ohio. He died on Nov. 29, 1923, in Cincinnati, Ohio, and was buried in Spring Grove Cemetery, Cincinnati.